Games Workshop is really trying. I honestly, truly believe it's trying. It's still making mistakes, and every step it takes is met by dogged resistance from the people who decided years ago that Games Workshop is the actual Devil. But it keeps trying, just the same. When Games Workshop released the Mighty Heroes "expansion" for Silver Tower, there was a lot of noise. The use of that word - "expansion" - was the main problem. For some people, four plastic miniatures, with no cards for actually using them in the game seemed like a bit too much of a stretch in terms of what an expansion should actually be. The counter-argument was, the rules for those four miniatures are already in the Silver Tower rules book, and are also in the app. Ah yes, the app... 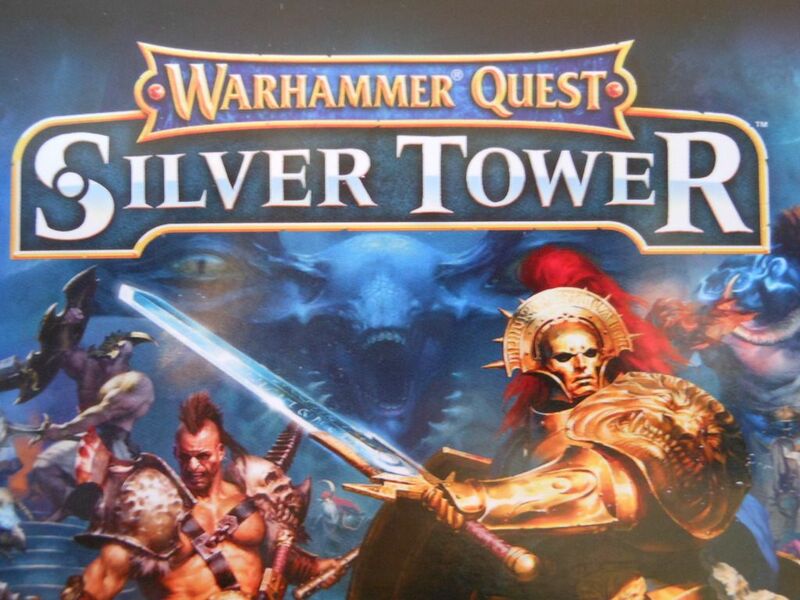 The Silver Tower app contains rules for over 40 additional heroes for use in the game (at a small charge to unlock each one, or a slightly bigger charge to unlock them all). But there is no way I'm using that. It's ugly, and poorly laid out. And besides, I don't use apps when I'm playing board games. While I was... content... to print out the hero cards from the rules book, and resigned to not using any extra characters from the app, I was one of the people crying out for physical cards. I contacted Games Workshop and told them real, physical cards would sell. Lots of other people did the same. Fast forward just a few short months, and a pack of cards with rules for 43 heroes (almost all of the heroes from the app, plus the extra heroes from the Silver Tower rules book) has just landed on my door mat. Maybe Games Workshop had always intended to make them. Maybe it was because we all asked for them. Whatever the reason, this simple card pack is probably one of the best things Games Workshop has done in a very long time. Now, I'm not going to do a proper review here. I'm not going to say which heroes are good or bad, or talk about strategies or synergies. Frankly, with this many heroes, it would take forever. And let's be honest... there is no way the designers tested all of these heroes fully. At a quick tally, there is something like 52 heroes in the game now. To run every combination of those characters to check for balance would be a mammoth operation too grand in scope to be worth the effort. We all just have to understand that some of these heroes are likely to be better than others, and in many cases they probably just have rules that seemed to match the fluff or sounded like they'd be a bit of a laugh. The pack retails for £15 (but is readily available for around £12 if you shop smart), and contains 45 cards in a cute little slipcase: 43 hero cards, one reference card for skeletons for the necromancer character, and one advertisement for the app. 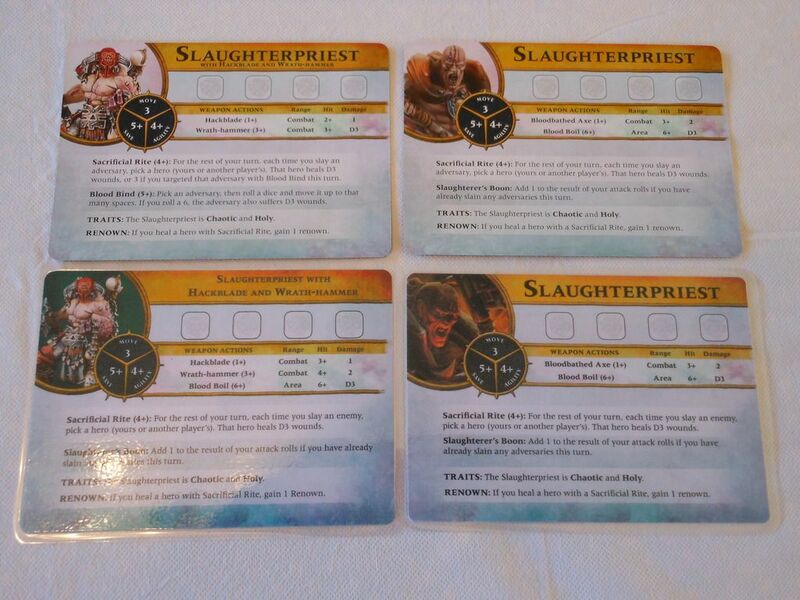 The cards are the same size (within a tolerance of a millimetre or so) as the cards found in the Silver Tower box. They are decent quality, but they don't have a linen finish or anything like that. The design varies slightly from the cards in the base game in that the image of each hero is a photograph of the relevant painted miniature, rather than a piece of hand-drawn art; and the backs of all of the cards are exactly the same, rather than showing a larger photograph of the character in a diorama. The changes make sense, purely from a cost perspective; but it does irk me ever-so-slightly that the cards don't match across the full set. Interestingly, Games Workshop has taken this chance to tweak some of the heroes. Certain characters, such as the Knight-Venator, have had tweaks to bring them in line with the recently published FAQ, and some of the wording has been tightened up. 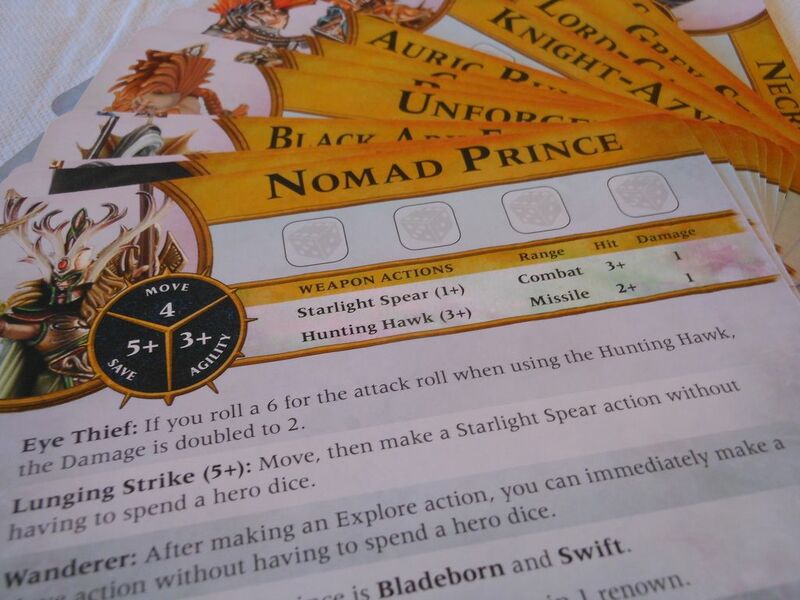 As a simple example, the wording for the Auric Runemaster's Forgefire ability was changed from "roll a dice for each miniature..." to "roll a dice for each hero or adversary..."
One of the most noticeable differences is the Slaughterpriest with Hackblade and Wrath-hammer (and by the way, whoever comes up with these names is having way too much fun). This character was free on the cover of September's White Dwarf magazine, with his rules printed inside. At the time of publication, I complained that he was virtually identical to the Slaughterpriest from the Mighty Heroes pack, only slightly weaker. However, this is no longer the case, as Mr Hammer has completely updated rules. He has lost the Blood Boil attack and the Slaughterer's Boon ability, and gained the ability Blood Bind. Both priests still have the Sacrificial Rite ability, but there are now minor differences, with Mr Hammer having the ability to boost its efficacy in certain situations. All told, the characters now feel more distinct. That Games Workshop took the time to tighten up the wording and rules for this card pack speaks volumes about the company's commitment to this product line. Actually, the mere existence of the cards speaks volumes about the company in general. This company is the Devil, remember? This company stamps on its customers, overcharges for everything, tries to grind opposition into the dirt, forces online retailers to abide by draconian rules, and stamps out creativity among the fanbase in defence of its IP. And yet the company has released a pack of cards at a very good price, which allows anyone interested in Silver Tower to proxy any damned miniatures they want. 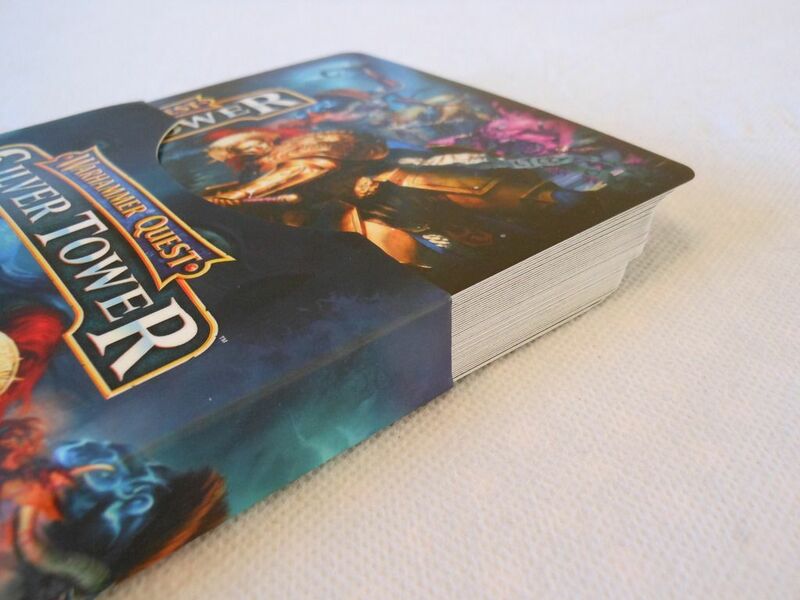 Buy this pack of cards, and you don't have to buy a single Games Workshop miniature to play. You could go adventuring with buttons and pins, and that Captain America bobblehead you normally keep on the car dashboard. Yet if you do want the official Games Workshop figures, you can just pick and choose the ones you want; or better yet, buy the discounted hero boxes (Mighty Heroes and Arcane Heroes). Of course, if you already have a large collection of Age of Sigmar miniatures, you don't need to do any of that. You're already set to play. I said it before, this is one of the best things Games Workshop has done. Well... the card pack includes some of the "exclusive" content Game Workshop released (the Lord of Plagues and the Battlemage), but it doesn't include the White Dwarf from the September issue of the magazine. It's not a massive loss, but it's a loss, just the same. Furthermore, the pack doesn't contain the branchwych hero. At the moment, the only way to get the hero card for that character is through the app. 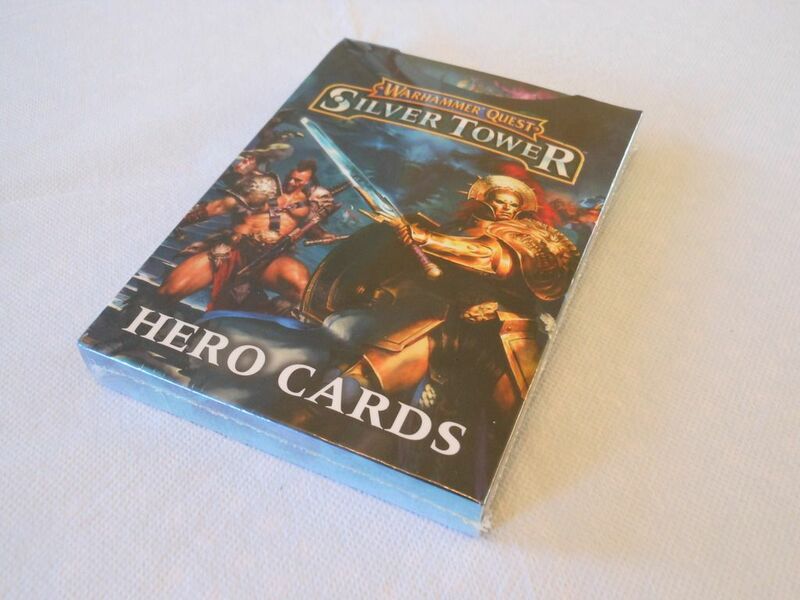 Finally, all the cards in the hero pack fit snugly in the slipcase, so there is no room to slide in the six cards from the Silver Tower base game, or any other cards you may acquire in the future. But okay, that's it. Overall, the cards do exactly what they set out to do. By purchasing them, I've got over 50 heroes to play with; more combinations than I can ever hope to use. Now, what else you got Games Workshop? The Silver Tower Hero Cards are available from Games Workshop stockists, and are a great way to enhance your dungeon-crawling experience. Although I don't own this game, the thought of these extra characters brings me joy. This is exactly the kind of fun thing which I loved from Games Workshop when I was growing up. Many companies these days would have sold individual characters for £30 a pop, each with a plastic miniature and it's own cards + tokens. The approach GW have taken, I imagine, will allow enormous customisation without too many extra fiddly things. It's a really great way of handling it, especially for people who own a lot of miniatures (either the official Age of Sigmar ones, or ones they can proxy with). Using a new hero in a game is as simple as grabbing one of these cards, and then finding a suitable model or gaming piece. Almost endless variety, with almost no impact on the wallet. I purchased Gorechosen last week (Games Workshop's new arena-based fighting game), and all four miniatures from that game have a hero card in this Silver Tower pack. So, right there, Gorechosen becomes as much an expansion for Silver Tower (and Age of Sigmar) as it is a game in its own right. I also have a few Games Workshop skaven, goblin, and dwarf figures lying around, all of which I can use as proxies for these hero cards. I'm going to go into this a bit more in a forthcoming review for The Lost Patrol, but GW is starting to feel more and more like a company that wants to invite you into the universe to play. It feels like they want you to create your own little rules and mix and match your collection; to actually have fun the way you want to have fun, rather than just the way the game out of the box tells you to. I am impressed with modern GW. Yes, some of the prices are too high but we're getting lots of new ideas -- and some older but nonetheless welcome ones -- and it's brilliant to see the company branching out from wargames. I am interested to see what happens with the FFG licensed stuff; five years ago I would expect GW to let those games disappear into obscurity, but now I'm not sure. Games Workshop pricing is pretty odd. Their boxed games and bundles are really quite good value (exceptional value if you are really into the miniatures), yet they still sell individual models for £18 or so each. My perception is they are trying to make the pricing more competitive without just lowering prices across the board. They want to maintain their "premium" status, and they don't want to show the weakness that comes from being forced to drop the price point. But yeah, I am very impressed with how GW is operating at the moment. I'm not sure there's much they can do with a lot of the FFG titles - in most cases it was their IP, but FFG's rules - but I wouldn't be surprised to see Age of Sigmar: Talisman, at some point in the next year or so. There might not be a card for the White Dwarf in the set... but there is that card promoting the app (with the same artwork on the back as the rest of the cards). With a copying machine, some glue and a pair of scissors you will have a sturdy card for Grombrindal in no time. Good thinking. I have already scanned Grombindl's cards from the White Dwarf magazine and laminated it. If I hadn't already done that, I might have been searching out a Pritt Stick right now.